San Marzano tomato is a variety of plum tomato. Amy P. Goldman calls the San Marzano "the most important industrial tomato of the 20th century"; its commercial introduction in 1926 provided canneries with a "sturdy, flawless subject, and breeders with genes they'd be raiding for decades." 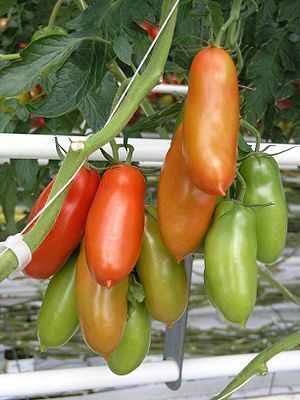 Though commercial production of the San Marzano variety is most closely associated with Italy, seeds for the variety are available worldwide.. It is an heirloom variety. Canned San Marzanos, when grown in the Valle del Sarno (valley of the Sarno) in Italy in compliance with Italian law, can be classified as Pomodoro S. Marzano dell'Agro Sarnese-Nocerino and have the EU "DOP" emblem on the label. Most San Marzano tomatoes sold commercially are grown in Italy, though they are produced commercially in smaller quantities in other countries. Because of San Marzano's premium pricing, there is an ongoing battle against fraudulent product. On November 22, 2010, the Italian carabinieri confiscated 1,470 tons of canned tomatoes worth €1.2 million of improperly labeled product. San Marzano tomatoes, along with Roma tomatoes, have been designated as the only tomatoes that can be used for Vera Pizza Napoletana (True Neapolitan Pizza). San Marzano tomatoes originate from the small town of San Marzano sul Sarno, near Naples, Italy, and were first grown in volcanic soil in the shadow of Mount Vesuvius. One story goes that the first seed of this tomato came to Campania in 1770, as a gift from the Viceroyalty of Peru to the Kingdom of Naples, and that it was planted in the area of San Marzano sul Sarno. In the United States, San Marzano tomatoes are the genetic base for another popular paste tomato, the Roma tomato. The Roma is a cross between a San Marzano and two other varieties (one of which was also a San Marzano hybrid) and was introduced by the USDA's Agricultural Research Service in 1955. ^ Saveur Magazine (3 December 2008). Saveur Cooks Authentic Italian. Chronicle Books. pp. 90–. ISBN 978-0-8118-6574-6. ^ a b Phelan, Benjamin (August 30, 2012). "Awesome Sauce". Slate. Retrieved 2012-09-11. ^ "San Marzano Tomato". bonnieplants.com. Retrieved 16 April 2015. ^ "Regulations for obtaining the use of the collective trade mark "Verace Pizza Napoletana" Production Rules ('Il Disciplinare')" (PDF). Associazione Verace Pizza Napoletana. ^ "History of Research at the U.S. Department of Agriculture and Agricultural Research Service". Agricultural Research Service. Retrieved 2012-09-11.